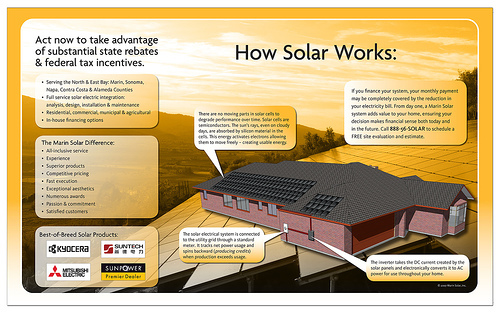 Act now to take advantage of substantial state rebates & federal tax incentives. There are no moving parts in solar cells to degrade performance over time. Solar cells are semiconductors. The sun’s rays, even on cloudy days, are absorbed by silicon material in the cells. This energy activates electrons allowing them to move freely – creating usable energy. The solar electrical system is connected to the utility grid through a standard meter. It tracks net power usage and spins backward (producing credits) when production exceeds usage. The inverter takes the DC current created by the solar panels and electronically converts it to AC power for use throughout your home. If you finance your system, your monthly payment may be completely covered by the reduction in your electricity bill. From day one, a Marin Solar system adds value to your home, ensuring your decision makes financial sense both today and in the future. Call 888-56-SOLAR to schedule a FREE site evaluation and estimate.